I should be surprised by this sight… a coyote wandering through a wetland corridor located in a suburban setting. However, as wild/rural habitat for this species diminishes, coyotes are expanding their range across North America because they seem to easily adapt to a wide variety of habitats. Lone coyotes are generally the exception, not the norm. 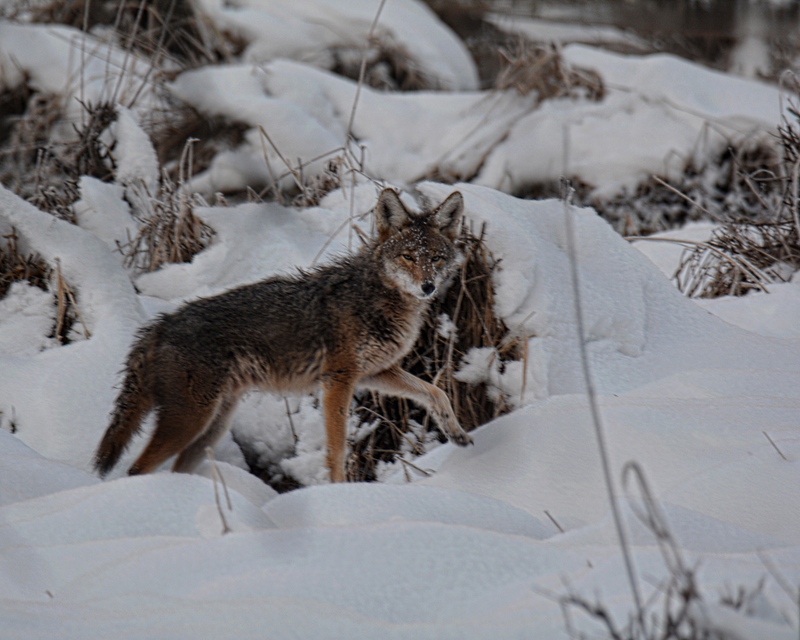 Sighting this coyote was a thrilling experience… but the responsibility of what to do was overwhelming to me. As a naturalist, I did not want to take any action that would bring harm to this beautiful animal. As an educator, I want to share information that can lead to understanding what a coyote inside city limits means… in terms of safety to the animal and the humans who encounter it. The Portland Urban Coyote Project manages a citizen science based research group that is coordinated through collaboration between Portland State University and the Portland Audubon. My daughter sent me the link to the Project. If you haven’t explored the site… go back and click on the link embedded in this post. You will learn about sightings in the Portland Metro area, and, importantly… about coyote life history, how to identify coyotes, and coexisting with coyotes. An article written by the Humane Society of the United States is also a very informative resource: What to do about coyotes. The striking solitude of the lone coyote spotted in my front yard encouraged me to learn more about how to coexist with nature’s creatures. I hope you are inspired to do the same. Glad to see you here, Jane. The poor coyote is lost. Hope it finds the way home. Such a solitary creature.